If you attended Evolution 2013, you probably heard quite a lot of chatter about ultra conserved elements. Essentially, ultra conserved elements (UCEs) are parts of the genome that are highly conserved between different species. Although UCEs carry little phylogenetic information, they are surrounded by increasingly variable flanking sequence (see figure). When combined with their flanking sequence these ‘UCE loci’ make ideal markers to study evolutionary relationships across variable time scales. For example, we have used UCEs identified in birds and reptiles to identify homologous UCE loci in amphibians, birds and reptiles. We have also identified these same UCEs in many published mammal genomes. An astute reader may wonder how it is possible to obtain UCE loci from taxa without sequenced genomes. The trick, it turns out, lies in the highly conserved UCE sequence. Because of their extreme conservation, it is possible to design complementary biotinylated probes to UCE sequences. These probes can then be used to enrich genomic DNA with a modified sequence capture approach that does not overly shear the genomic DNA thereby preserving the informative flanking sequence. The enriched DNA is then sequenced on a next-generation sequencer (e.g., an Illumina HiSeq) and the ultra-conserved regions are de novo assembled. With current protocols, this can yield close to 5000 unique UCE loci in most amniotes. These loci can then be used to resolve phylogenies from non-model taxa at an unprecedented genomic resolution. 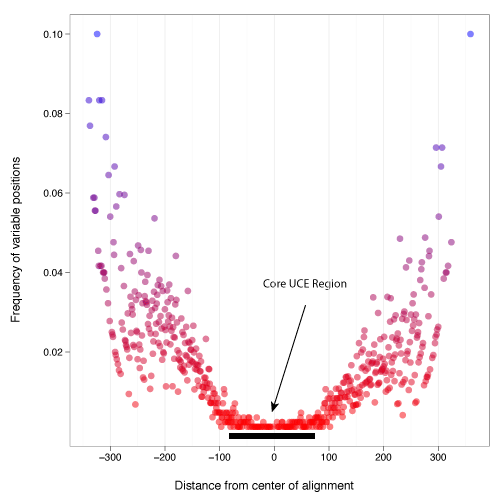 Travis Glenn, Brant Faircloth, and I have been working on this method since around 2007, first doing the alignments and identifying the UCE loci. We brought in Kevin Winker, Patty Gowaty, then Rob Brumfield and John McCormack because of our shared interests in avian phylogenomics as well as additional systematics chops. My primary role has been to develop the computational pipeline for inferring individual gene trees from each UCE locus and converting these into a species tree. However, I’m now a Post Doctoral Fellow at the California Academy of Sciences and in collaboration with Brian Simison and Anna Sellas we’re starting to sequence UCEs from a number of taxa. This means I need to run the whole protocol from start to finish, and so I thought I might write a few blog posts that may serve as a guide for other lab groups interested in sequencing and analyzing UCE loci. We just received our first batch of probes so my next post will be about ordering the necessary materials and tools. I'm a computational genomics Post Doctoral Fellow at the California Academy of Sciences. I'm working on a number of projects including vertebrate systematics and the genomics of adaptation in lizards, heliconius butterflies, and Hawaiian drosophila. This entry was posted in genomics, methods, phylogenetics. Bookmark the permalink.